WOMEX 05 was a bumper year – we had Tiken Jah Fakoly (Cote d'Ivoire), Marcelo D2 (Brazil), Tengir Too (Kyrgyzstan) and Robert Plant (UK) amongst many more...including Debashish Bhattacharya (India). 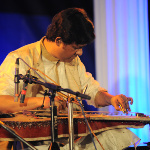 He's India's inventor and primary exponent of the Hindustani slide guitar, and is both a master of the classical style and a pioneer of world fusion, mixing subcontinental styles with jazz, Latin and blues styles. 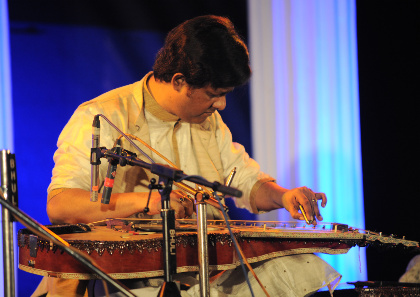 We have two tracks for you today – one from each of Debashish's repertoires – one of his more progressive pieces 'Sufi Bhakti', as performed in 2013 with Subhasis Bhattacharjee on tabla, and a performance of the classical Raga Kedar in Jhaptal with Gourishankar Karmakar. Enjoy!